Students' bicycles lined up at Rocky River Middle School during the first day of the Bike To School Challenge in 2015. May is National Bicycle Month. 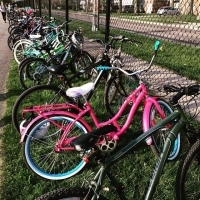 For over 1,200 middle school and elementary school students in Rocky River, that means Bike To School Month as the annual Rocky River Bike To School Challenge returns for the sixth year. The Rocky River Bike To School Challenge began in 2011 at Rocky River Middle School, and expanded to Kensington Elementary School in 2015. During May, students are encouraged to ride their bikes to school to help the environment, get more physical activity to improve their health, have fun, and win prizes. The Bike Challenge for Rocky River Middle School began on Monday, May 2 and ends on Friday, May 20. The one-week Bike Challenge for Kensington Elementary School begins on Monday, May 16 and ends on Friday, May 20. Students carry a "Ride Card" that is stamped each day they ride a bike to school. When they accumulate four bicycle rides to school, students receive a free t-shirt from the main Bike To School Challenge sponsor and organizer, Century Cycles of Rocky River. The more students bike, the more they can win – every Ride Card they fill up earns them more entries into a grand prize raffle that includes two new bicycles per school from Raleigh Bicycles. Safety is also rewarded: Students earn twice as many entries if they wear a bicycle helmet. Wednesday, May 4, has been designated as National Bike To School Day, and the schools expect record participation. On last year's National Bike To School day, 348 Rocky River Middle School students, or 58% of the student body, rode their bikes to school. Overall in 2015, students in the Rocky River Bike To School Challenge pedaled over 25,000 miles during the three-week program, saving their parents over $2,700 in gasoline, and burned over 650,000 calories, the equivalent of over 3,600 cans of Coca-Cola. Sponsors of the Rocky River Bike To School Challenge are Century Cycles, Raleigh Bicycles, Bike Cleveland, Subway (located in the Riversquare shopping plaza on Detroit Road), Starbucks Coffee, Honey Hut Ice Cream Shoppe, Whole Foods Market, River Dog Cafe, and the Rocky River PTA. Kevin Madzia is the Information Technology Manager and a Bicycle Fit Specialist for Century Cycles.